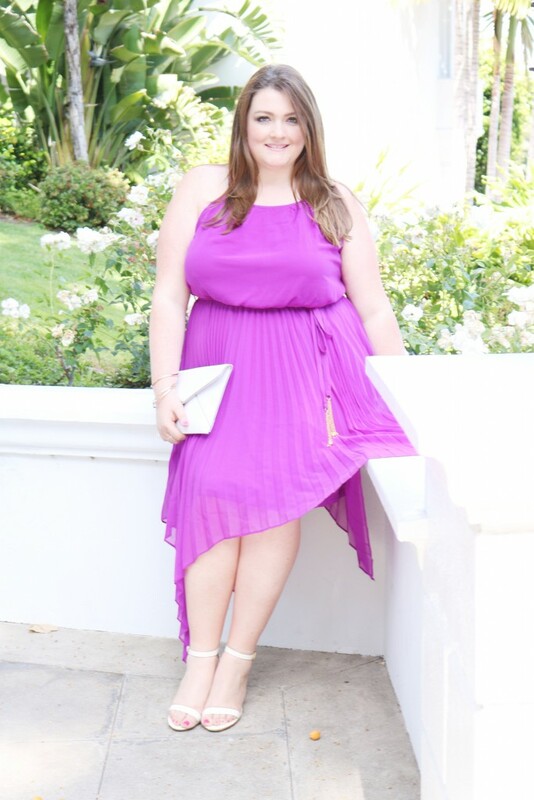 I am so into bright colors right now, especially jewel tones like this divine pleat purple maxi dress from City Chic! It’s one of those dresses that you just can’t help but to feel fancy in. Plus given my feelings on purple (its basically one of my favorite colors EVER) there was no question this dress was going in the weekend brunch/party/event rotation. A few quick style notes – I love a good fit and flare dress. It has just enough shape with the tie waist but also gives me enough freedom to move and who doesn’t love that?! Lastly, I’m kind of a minimalist when it comes to accessories so the white clutch, white strappy heels and gold wrap bracelet were nice touches but still let my dress do all the talking! Purple is such a flattering color on everyone, you look lovely! Very nice purple dress! You are beautiful! So cute! It’s definitely the perfect time of year for such a cute, colorful dress. Iper Great Look ! ! ! That purple looking dazzling on you. So beautiful. Thank you! I love purple!! Hi Rachel! You look lovely..Purple is really complementing your complexion..And I am so much in love with your heels..You look really really pretty..Seriously…I will try this style for sure..Thank you for sharing. thank you! I am a huge fan of fit and flare dresses and this color was just too good to turn down. LovelyInLA, I’m coveting that purple fit and flare dress. It would look fabulous with our pearl drop statement necklace from Chic24Hours. What say you about the combo?